Intros can make or break your story. They are hard to write well. It’s also hard to lay down laws about intros. Their success depends on the voice that delivers them and the nature of the story they serve. But we’ll try, based on a few examples below. (You should also check out Radio intros: 7 tips to keep listeners from turning off the radio and What NPR One can teach us about radio intros). Please note: The intro’s natural habitat is sound, not text. So listen to the beginning of these files, and then use the text of the intro as a secondary reference! Just because a story is the day’s top news doesn’t mean its intro can’t be creative or narrative-driven. It begins with a visual image: “One guy” walking onto the car lot with “special letters.” Character, setting, action. A more typical (and less good) intro would have felt obligated to communicate the day’s headline first — that Chrysler dealerships are getting closure notices. Reporter Martin Kaste still conveys that, but in a scenic way. It is structured like a mini-narrative, including suspense. Dealers are waiting. One guy walks onto the lot. He’s holding a letter. It’s bad news. And so on … Now I want to know what happened! It doesn’t try to do too much: We don’t learn why Chrysler has gone bankrupt, why certain dealerships are targeted, or how much of a financial drag dealerships are on the company. Martin just gets us started, and the intro is an implicit promise that we’ll get to the bigger picture — through the eyes of dealers themselves. If I say to you, “Let’s talk about congressional redistricting!” your eyes may glaze over. So every time a reporter or host has to take on this topic — or other complicated, wonky subjects — they face the challenge of reminding us what the heck it is and why it matters. Nina Totenberg, along with editor Ron Elving, succeeded in this Morning Edition set-up for the day’s Supreme Court arguments. It offers a visual analogy. The phrase “madman’s jigsaw puzzle” grabs the ear. It’s imaginative and visual. Not to mention the fact that it perfectly captures what many congressional districts look like (check it out; crazy, right?). It lays out the history you need to understand the story. We hear not only the what but the why, without getting into the weeds. It doesn’t presume we already understand. To politicos, it’s old hat that “district lines are drawn by state legislators who to help their own parties.” For the rest of us, it’s helpful to have a basic explainer. And we have to communicate to everyone, not just those in the know. Our job is not only to communicate news and information, but also to explain to people why they should care. Sometimes, that means starting your intro with a big idea, rather than the story itself. It begins with a universal theme. Listeners who don’t care about Laura Ingalls Wilder might have tuned out if her name led the story. Instead, All Things Considered host Melissa Block and producer Matt Ozug began with the idea of childhood mysteries. They’re telling the audience this story is about more than one book or author. The writing is playful. OK, one woman’s humor is another’s bad joke … Still, whatever you think of the phrase “sold like hot johnny cakes fried up in bacon drippings,” it sure jumps out the radio. It is surprising. This intro’s format is so different from the usual intro, it makes you lean in and want to hear what comes next. The performance is good. Not all hosts are game for this sort of thing but Audie and Ari were — and they delivered. It’s simple. This intro has to set up a story by Sonari Glinton about a complicated economic idea. With this playful but straightforward approach, the intro makes the topic more inviting than it might be otherwise. It takes advantage of the program’s assets. 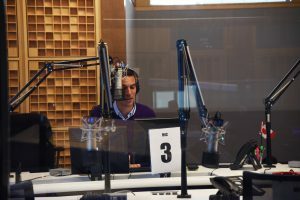 For a show like All Things Considered, there are two hosts in the studio introducing stories. Why not let them actually sound like they’re in the studio together? Don’t give away the punch line! It promises a surprise (and the piece delivers). In this case, it’s OK to “bury the lede” (the Ghanaian president plagiarized) because it’s not significant news for the majority of our listeners. It explicitly asks you to listen. After promising a surprise, it makes a direct appeal to the listener: If you listen closely, the surprise will be revealed. Naturally, every intro intends to inspire listening but this is a good case when the explicit appeal is merited. It’s short! This a punchy intro that simply sets the table and makes you want the meal, without wasting any time. Do you have other examples of great intros to share? Let us know at TrainingTeam@npr.org.